His research interests include distributed systems, design, programming techniques, software development tools, and programming languages. He is actively involved in the ANSI/ISO standardization of C++. Dr. Stroustrup is a Managing Director in the technology division of Morgan Stanley in New York City and a Visiting Professor in Computer Science at Columbia University. 2019: Honorary doctor of University Carlos III in Madrid, Spain. Doctor Causa Honoris ceremony. Prof. J-Daniel Garcia-Sanchez' intoduces me (Laudatio): 40:54. My speech (Lectio Magistralis): 51:00. 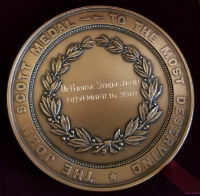 2018: The John Scott Legacy Medal and Premium from The Franklin Institute and the City Council of Philadelphia; the 2nd oldest US award for scientific accomplishment, awarded since 1822 to men and women whose inventions improved the 'comfort, welfare, and happiness of human kind' in a significant way. Notable recipients include Madame Curie, Thomas Edison, the Wright brothers, Nikola Tesla, Jonas Salk, Alexander Fleming, Charles S. Draper, and Richard E. Smalley. 2018: The Computer Pioneer Award from The IEEE Computer Society For bringing object-oriented programming and generic programming to the mainstream with his design and implementation of the C++ programming language. The award recognizes a contribution of lasting value; it is at the earliest given 15 years after the work it recognizes. Notable recipients include John Backus, Bob Barton, Tony Hoare, David Kuck, Peter Naur, Maurice Wilkes, and Niklaus Wirth. Also: IEEE CS press release. 2018: The Charles Stark Draper Prize from The US National Academy of Engineering for conceptualizing and developing the C++ programming language. This is the NEA's highest honor and one of the world's highest honors for an engineer. Notable recipients include the inventors of the chip, the jet engine, communications satellites, fiber optics, GPS, CCDs (digital cameras), and also a few computer scientists including: John Backus, Vint Cerf, and Tim Berners-Lee. Also: Draper Labs press release incl. streaming video of the event. My acceptance speech starts at 14:30. Also: an Encyclopedial Britannica entry. Also: my acceptance speech from The Bridge. 2017: The Faraday Medal from the IET (Institute of Engineering Technology) for significant contributions to the history of computing, in particular pioneering the C++ programming language. 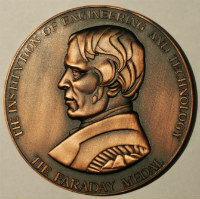 The Faraday Medal is the IET's highest honor. 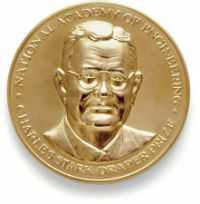 Notable recipients include J.J. Thomson, C.A.R.Hoare, Donald Knuth, and Maurice Wilkes. The institute of Engineering Technology (the IET) is one of the world's oldest and largest engineering institutions with over 168,000 members in 150 countries. 2017: Elected Honorary Fellow of Churchill College, Cambridge. 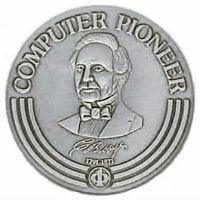 2015: Fellow of the Computer History Museum "For his invention of the C++ programming language" (2015). 2015: The Dahl-Nygaard senior prize from The European Organization for Object-Oriented Technologies. 2013: Electronic Design Hall of Fame. 2013: Honorary Doctor of Computer Science from The National Research University, ITMO, St. Petersburg, Russia. ITMO is a top Russian technical university, best known for winning the International Collegiate Programming Contest (ACM ICPC) five times -- more than any other university in the world. Other honorary doctors include Tony Hoare (2013), John Hopcroft (2009), and Niklaus Wirth (2005). 2013: The Golden Abacus Award from Upsilon Pi Epsilon -- an award that is presented to the individual who has gained professional renown and who, over several years, has provided extensive support and leadership for student-related activities in the computing and information disciplines. 2010: Honorary Professor in Object Oriented Programming Languages, Department of Computer Science, University of Aarhus. 2010: The University of Aarhus's Rigmor og Carl Holst-Knudsens Videnskapspris. The university's oldest and most prestigious honor for contributions to science by a person associated with the university. 2008: Dr. Dobb's Excellence in Programming award. 2005: The William Procter Prize for Scientific Achievement from Sigma Xi (the scientific research society) as the first computer scientist ever. 2004: Member of the Texas Academy of Medicine, Engineering, and Science. 2004: Elected member of The National Academy of Engineering for the creation of the C++ programming language. 2004: The IEEE Computer Society's Computer Entrepreneur Award for pioneering the development and commercialization of industrial-strength, object-oriented programming technologies, and the profound changes they fostered in business and industry. 2002-2006: Honorary Professor at Xi'an Jiao Tong University. 1995: Named one of "the 20 most influential people in the computer industry in the last 20 years" by BYTE magazine. 1995: "The Design and Evolution of C++" received a Dr Dobb's "Productivity Award" for helping programmers to improve their code. 1993: AT&T Bell Laboratories Fellow. 1993: The ACM Grace Murray Hopper award for his early work laying the foundations for the C++ programming language. based on those foundations and Dr. Stroustrup's continuing efforts, C++ has become one of the most influential programming languages in the history of computing. The GMH award is given for a significant achievement before the age of 35. Many of the GMH recipients went on to do further great things. 1990: Named one of "America's twelve top young scientists" by Fortune Magazine. 1990: "The Annotated C++ Reference Manual" received Dr Dobb's "Jolt Cola" award for excellence in technical documentation. 2011: University Distinguished Professor (honorable title, bestowed "in perpetuity"). 2010: Promotion to Distinguished Professor (the university's highest academic rank). 2009: Association of Former Students' Distinguished Achievement Award (University level) for Research. 2004: Texas A&M IEEE student chapter's Distinguished Professor Award. Born in Aarhus Denmark 1950. Cand.Scient. (Mathematics and Computer Science), 1975, University of Aarhus Denmark. Ph.D. (Computer Science) 1979, Cambridge University, England. His non-research interests include general history, light literature, photography, hiking and running, travel, and music. He lives in New York City with his wife; their daughter is a medical doctor and their son is a research professor in systems biology. Bjarne Stroustrup is the designer and original implementer of C++ as well as the author of The C++ Programming Language (Fourth Edition), A Tour of C++ (Second edition), Programming: Principles and Practice using C++ (Second Edition), and many popular and academic publications. Dr. Stroustrup is a Managing Director in the technology division of Morgan Stanley in New York City as well as a visiting professor at Columbia University. He is a member of the US National Academy of Engineering, and an IEEE, ACM, and CHM fellow. He received the 2018 Charles Stark Draper Prize, the IEEE Computer Society's 2018 Computer Pioneer Award, and the 2017 IET Faraday Medal. His research interests include distributed systems, design, programming techniques, software development tools, and programming languages. He is actively involved in the ISO standardization of C++. He holds a masters in Mathematics from Aarhus University, where he is an honorary professor, and a PhD in Computer Science from Cambridge University, where he is an honorary fellow of Churchill College. Personal website: www.Stroustrup.com. Bjarne Stroustrup designed and implemented C++. C++ has become one of the most widely used programming languages by making abstraction techniques affordable and manageable for mainstream projects. Using C++ as his tool, Stroustrup has pioneered the use of object-oriented and generic programming techniques in application areas where efficiency is a premium; examples include general systems programming, switching, simulation, graphics, user-interfaces, embedded systems, financial systems, games, and scientific computation. For about two decades, C++ has been among the most widely used programming languages. One recent (Fall 2015) survey estimated C++'s users community to include 4.4 million programmers. The influence of C++ and the ideas it popularized are clearly visible far beyond the C++ community. Languages such as C, C#, Java, and Fortran now provide features pioneered for mainstream use by C++. Recently, he has been engaged in a project to give meaning to "modern C++" as a completely type-safe and resource-safe language and help users to use it as such. His book "The C++ Programming Language" (Addison-Wesley, first edition 1985, second edition 1991, third edition 1997, "special" edition 2000, fourth edition 2013) is the most widely read book of its kind and has been translated into at least 19 languages. A later book, The Design and Evolution of C++ (Addison-Wesley, 1994) broke new ground in the description of the way a programming language was shaped by ideas, ideals, problems, and practical constraints. His programming textbook Programming -- Principles and Practice using C++ (Second edition), has been translated into 10 languages. His most recent book, A Tour of C++ (Second edition) gives an overview of the C++ language and its standard library for experienced programmers. In addition to his ten books, Stroustrup has published more than a hundred academic and more popular papers. In 1989, he took an active role in the creation of the ANSI/ISO standard for C++ and continues to work on the maintenance and revision of that standard. He received many international honors for his work. It has been noted that he is to only Dane to receive the NAE Draper Prize, IET The Faraday Medal, the John Scott medal, and the ACM Grace Murray Hopper Award. Bjarne was born in and grew up in Aarhus, the second largest city in Denmark. He went to Aarhus University studying in the department of computer science (then called DAIMI) gaining the Danish equivalent to a good Masters degree (a Cand.Scient. degree is rarely taken in significantly less than six years - at least it wasn't then). Aarhus is a wonderful town of about 250,000 people beautifully sited on the East coast of Jutland. Bjarne did his Ph.D. work on design of distributed systems in the Computing Laboratory of Cambridge University, England. The Cambridge Computer Laboratory celebrated its 75th anniversary in 2013 (The history of the CL is documented in a very nice and readable book). He is an Honorary Fellow of Churchill College where he and his wife, Marian, spent some wonderful and busy years and where their daughter was born. Cambridge is another wonderful town and one of the magical places of the world. His thesis advisor in Cambridge was David Wheeler and he also spent significant time talking with (learning from) Roger Needham. He didn't really get to know Maurice Wilkes until years later. He shared an office with Bruce Croft, Jeremy Dion, Neil Grey, David Harper, Andy Hopper, and Mark Pezzaro. You can find a few more personal details and some information about the birth of C++ in Steve Lohr's Go to: The Story of the Math Majors, Bridge Players, Engineers, Chess Wizards, Scientists and Iconoclasts who were the Hero Programmers of the Software Revolution. Basic Books. ISBN 0-465-04225-2; 2001 and also in Paul McJones' interview for The Computer History Museum's Oral History Collection. In 1979, Bjarne Stroustrup, together with his wife and daughter, moved to New Jersey to join the Computer Science Research Center of Bell Telephone Laboratories (colloqually know as 127 or 1127). Over the years, they lived in Summit, Meyersville, and Watchung - all about 10 minutes drive from Bell Labs' main research site in Murray Hill. A son was born in Meyersville. After the 1984 break-up of the Bell System, Bell Labs became AT&T Bell Labs, and after the 1995 break-up of AT&T, AT&T Bell Labs was itself split into AT&T Labs and Lucent Technologies Bell Labs. From its inception, Bjarne was a member of AT&T Labs - Research, the half of Bell Labs Information Sciences Research that AT&T kept to itself as Lucent and NCR were spun off. Bjarne was the head of the Large-Scale Programming Research Department from its creation in AT&T Bell Labs until late 2002 when he joined the computer science department of Texas A&M University. He retained a link with AT&T Labs - Research as an AT&T Fellow until 2012. From 2002 to 2014, Bjarne was the College of Engineering Chair in Computer Science Professor at Texas A&M University. He and his wife lived in a house in a quiet wooded area of College Station, Texas. After leaving for NYC in January 2014, he retains a link to TAMU as a University Distinguished Professor. He was a member of the Parasol group in the Computer Science and Engineering Department. Fall 2011: On sabattical ("development leave") in the Princeton CS department. Spring 2012: On sabattical ("development leave") in the Cambridge Computer Lab and overseas fellow of Churchill College. Since October 2011, he has been on the board of advisors for RollApp, a Cloud computing startup. He is an advisor to the Norwegian startup includeOS. IncludeOS is an open-source minimal unikernel developed in C++. As of January 2014, Bjarne is a Managing Director in the technology division of Morgan Stanley in New York City, a Visiting Professor in Computer Science at Columbia University, and an honorary fellow of Churchill College, Cambridge. The move to New York was prompted by Marian and Bjarne wanting to be nearer to their children and (especially) grandchildren. Bjarne also wanted to refresh his acquaintance with critical software development. Academic concerns can distract from work aiming squarely at solving industrial problens (e.g., of scale and reliability). He and his wife live in New York City; their daughter is a medical doctor and their son is a professor in systems biology.